The press center of the Anti-Terrorist Operation says that the pro-Russian militants shot at the Ukrainian positions 51 times overnight. "The situation in the zone of the ATO escalated. In the Christmas night, the militants from the pro-Russian illegal armed groups once again showed their true attitude to the Christian values. The invaders have established a real New Year’s record for the number of violations of the" total silence" ceasefire. Following the instructions of their masters from Moscow, the enemy used weapons against the Ukrainian defenders 51 times," reads the report. In particular, the gunmen opened fire from the automatic mounted grenade launchers in the area of ​​Maryinka and from small arms and grenade launchers at Verhnetoretske. From the same weapons they hit twice on the Ukrainian positions at Granitne in the direction of Mariupol. Read alsoRussian proxies shell Ukraine troops from 82mm mortarsIt is noted that the pro-Russian hybrid gangs provoked ATO forces to return fire on the outskirts of Horlivka. In particular, using heavy machine guns, rocket launchers of different systems and small arms, terrorists hit in the direction of Maiorske, Zaitseve and Novhorodske. "In the early hours of the day, the adepts of the "Russian world" opened fire about 10 times in the direction of our soldiers. In particular, they led aimed fire from small arms near Novhorodske. 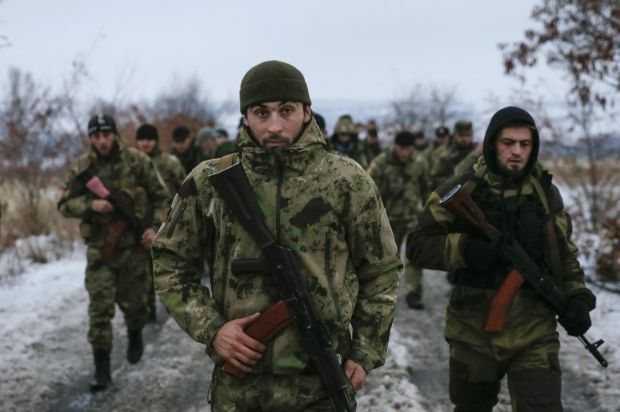 The invaders also opened harassing fire from rocket-propelled grenades, small arms and heavy machine guns in the area of the Donetsk Airport and north of Horlivka," the report says. Read alsoMilitants fire 20 times at Ukrainian positions overnightIn particular, several 120mm mortar shells, prohibited by the Minsk agreements, exploded near positions of the ATO forces near Zaitseve a few minutes after midnight.